It's the middle of winter, muddy and grey. Sometimes on rainy days my chickens spend much of the day "in bed" - in other words, up on their perch. This amuses me greatly! 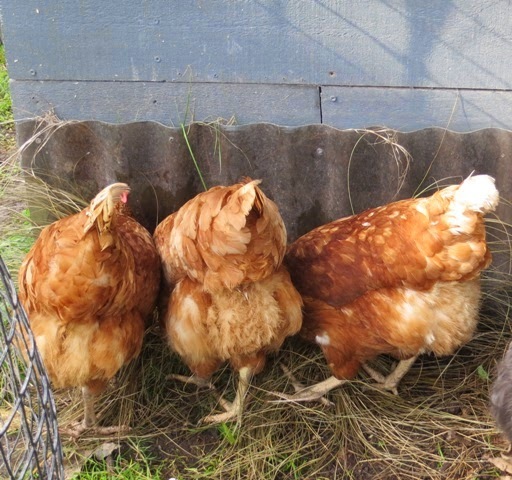 At this time of year the soil never dries out, and that really matters to confined chickens. These wonderful birds love to spend their days scratching and pecking through mulch, finding and gobbling insects and other greeblies. And my silverbeet, of course. The stalky look is not good. 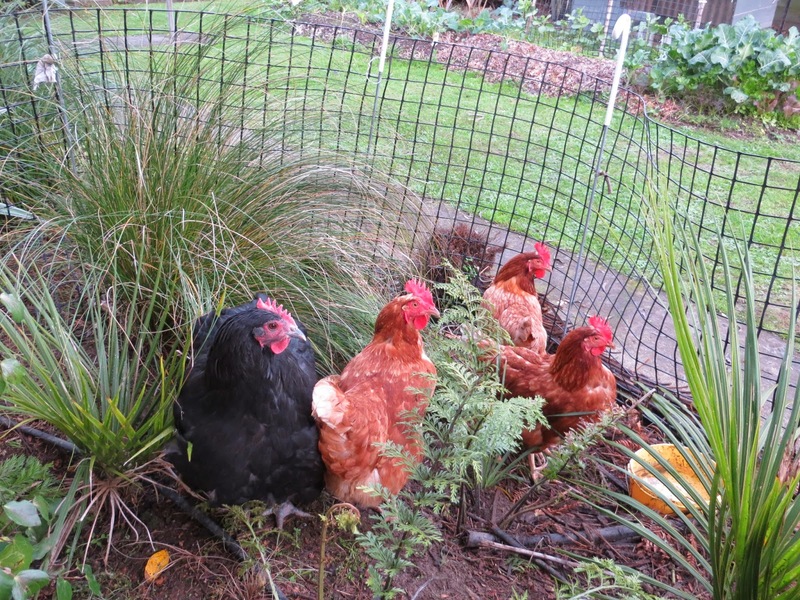 The vegetable munching of free-ranging chickens is a big problem. Another is that they poo on paths. (Well, why would they poo on the grass? That is where they peck and eat!) Children walk barefoot on paths and then into the house. So I fence my chickens into a pen. 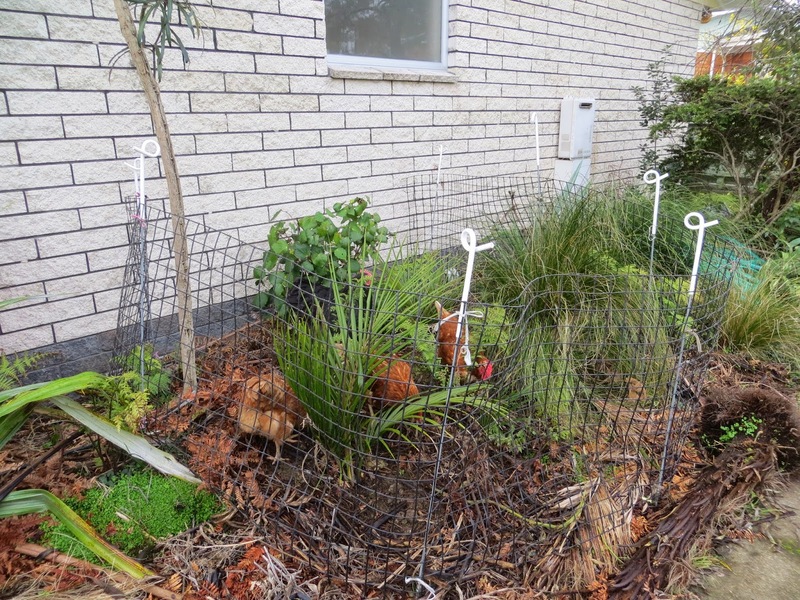 It's the only solution for most urban chicken keepers. Unfortunately at this time of year the pen's soil is quickly exhausted , and they end up on a hard, smelly pan of dirt. The best option is to regularly move the pen. We don't have much space for that. Another option is to chuck lots of stuff, such as weeds or leaves, into the pen to create some mulch for them to scratch through. Every now and then I also dig over the soil, but when I did it recently my nostrils were greatly offended. I know chickens have a good sense of smell, so it must be a fairly torturous situation for them - their flooring, their entertainment and their dinner plate are all foul. It's too foul for my fowl. But I can do better. I've come up with a way to give them a "holiday" on a bit of fresh ground. Earlier this month I went to the Fieldays (no spelling mistake, it really has only one d). I bought a bunch of horse-size electric fence posts for $40. I felt like a real farmer! 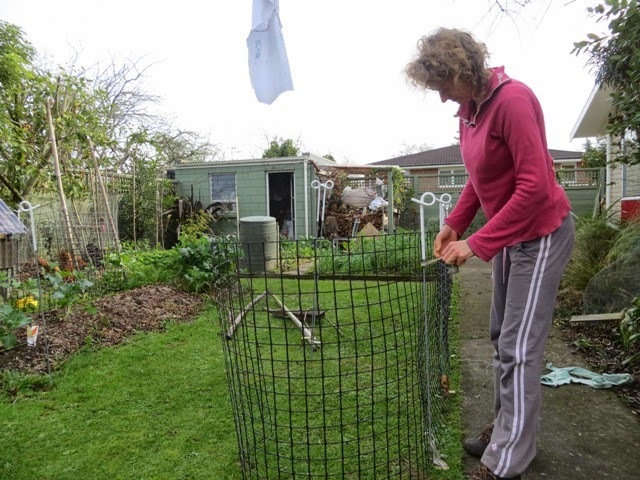 I like the posts because they are light, but most importantly they are easy to get in and out of the soil, and therefore form the basis of an easily portable fence. Back home I used strips of old clothing and whatever else I could find to tie some plastic garden mesh between the posts to make my moveable fence. The mesh is only 90 cm high - not high enough to imprison agile birds like brown shavers if they really want to escape - but I've noticed that on fresh ground they don't try. So now my chickens have happy little breaks from their overused soil for a few hours at a time whenever the fancy takes me. I love watching them in their element, heads down and tails up, as they happily work hard at discovering goodies. One of their favourite spots seems to be under our citrus trees. I suspect that they are eating something there does bad things to the citrus, which have whitefly and sooty mould. The slug damage to the ripe fruit weighing down our mandarin tree certainly seems to have stopped. A tip: If you like to give your chickens fresh ground in this way, remember to give them a bowl of water in their temporary pen. They need to drink little and often, even in winter. Can you spot the vege garden safe in the background? This kind of ground is paradise for chickens. 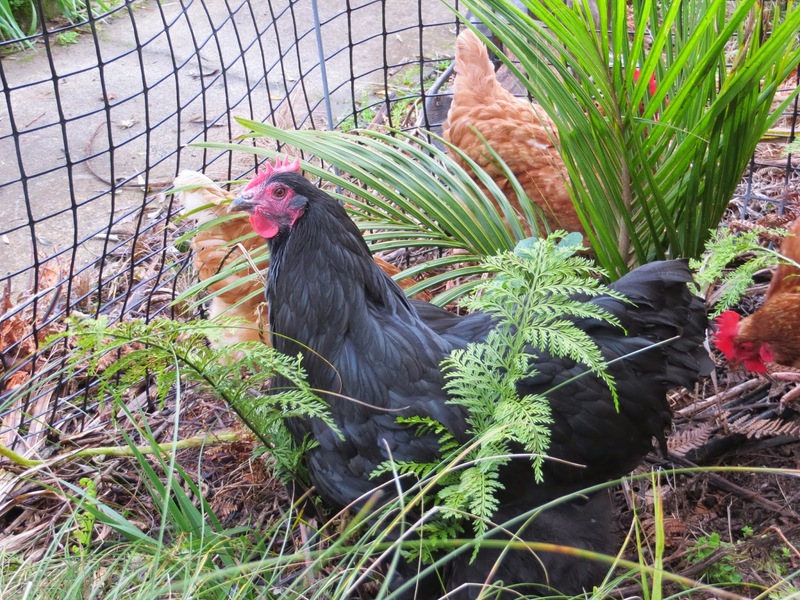 Remember, thousands of years ago they were junglefowl - give them a bit of jungle whenever you can!